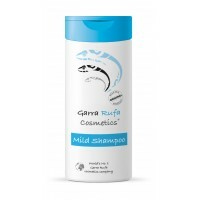 This mild Dead Sea shampoo of Garra Rufa Cosmetics cleans the scalp, helps fight dandruff and strengthens the hair soft and smooth in a very special way. 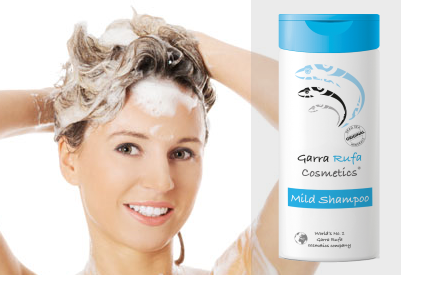 It is based on the enzyme of the Garra Rufa fish, that makes the hair very soft & smooth. This shampoo is enriched with the salts and minerals from the Dead Sea. It makes the hair easy to comb and gives the hair a healthy shine and volume. This product is suitable for all hair types. Apply shampoo to damp hair in massaging, let it soak and then briefly rinse. The shampoo may be used daily. Exclusive and unique Dead Sea product range, based on the enzyme of the Garra Rufa fish. An indispensable product line for each fish spa, pharmacy, cosmetic shop and spa. Would you like to create more sales in your shop? Then take your chance and purchase this exclusive and unique Dead Sea product range. Success assured!